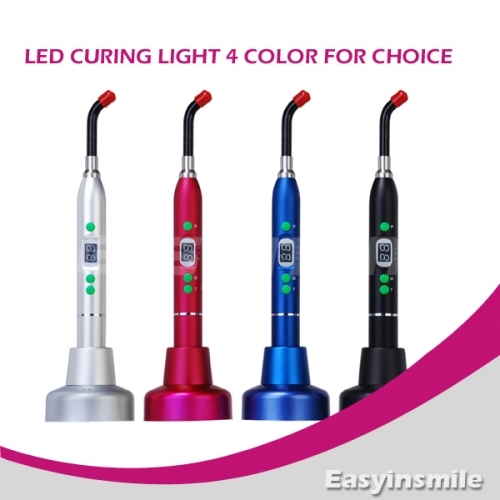 Advertiser: Easyinsmile (HK) business Co.
A dental LED curing light is a piece of dental equipment that is used for polymerization of light cure resin based composites.It can be used on several different dental materials that are curable by light. The light used falls under the visible blue light spectrum. This light is delivered over a range of wavelengths and varies for each type of device. The latest LED curing light is the HP (high powered LED light). This newest light is an updated LED curing light and can cure material much faster than the Halogen and the previous LED curing lights. It uses a single high-intensity blue LED that uses a larger semi conductor crystal. This increased the light intensity and the area that is illuminated with an output of over 1,000 mW/cm2.In order for this light to emit such a high intensity light, it uses a highly reflective mirror film that “consists of multilayer polymer film technology. Fit for polymerization of light cure resin based composites. Contact Click here to contact Easyinsmile (HK) business Co.